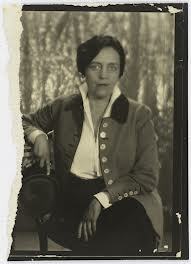 Romaine Brooks, Natalie Barney, and Lily de Gramont shared an interest in Astrology and Tarot throughout their lives, as was Natalie’s other lover Dolly Wilde. This does not strike one strange because during the 19th and currently, people are curious about what the future holds and how it will affect their lives and loves. In 2014, author and translator, Suzanne Gerber-Stroh consulted an astrologer to construct birth charts for Romaine Brooks and her intimates. Here are the results. Satisfy your insatiable curiosity and make what you will of how closely Mr. Mann’s findings correspond to the personalities of these highly creative and productive gay women. For more go to Suzanne Stroh’s link and look for the 2014 entry. A terrific and timely interview with me in Ms. Magazine by Mary Meriam. Sexual politics are alive and flourishing in the GOP presidential race and in the current debates regarding Hillary Clinton’s qualifications for the office. So having independent women like Romaine Brooks and her circle, having their say about real women’s lives and creativity is a blessing. Romaine’s circle of women and lesbians forged their own notions of a room of one’s own, in their case several houses and shared households, as well as space to spread their creative wings wide. Their notions of how to live authentic lives are much more contemporary than they have previously been given credit for. Not everyone will want to emulate their lifestyle, but we have to give them full credit for demanding one given the limitations placed on women during the interwar period and beyond. I hope that my book, Romaine Brooks: A Life (University of Wisconsin Press) which is now at the compositors will help to clarify how Romaine and Natalie envisioned true female independence They both faced overwhelming odds against any woman, much less a lesbian feminist being truly her own woman. They both struggled to find themselves and enable other women to be thoroughly modern in their sense of it. I sometimes wonder what people will take away with them from my book. I look forward to finding out. Romaine Brooks well knew what having the impeders drag you down felt like, and she imagined it here for all of us to identify with when we encounter our own impeders! I never started out as a biographer. It was always about how I took in the picture before me, tasted it, rolled it over, let it sit in my sensorium, and savored all its flavor — appreciating the artistry of the maker; composition, color, execution, emotions. In short, I was able to follow along when an artist grabbed me with just one look and took me to places both familiar and strange. From childhood, even as a small toddler, I’ve had this uncanny ability to experience words and pictures in the most intense way. It was one of these experiences (as I write in my introduction to Romaine Brooks: A Life (forthcoming from University of Wisconsin press in 2015) that set me on a 44-year course of investigation. I left me with a need to know so intense that throughout my academic and teaching career I felt compelled to follow the elusive trail that Beatrice Romaine Goddard (Brooks) had forged. It began with the first scholarly/critical article to be written in America on Brooks’s intriguing, chromatically painted portraits. I followed up with a lecture that garnered the attendance of an ACLU representative from Florida International University. This was, after all, the early 1970s, and I was an out lesbian dealing with an out subject and painter of lesbian and gay subjects. Over the years I continued to write critical commentary on any Brooks articles and/or essays that appeared. Finally, in 2000, after reading yet another essay sidestepping the problems of Brooks’s complicated relationship with D’Annunzio and right-wing conservative politics of the period, my frustrations propelled me to deal with the issue head-on. I then published two more articles to set the framework for an in-depth look at Romaine’s fascist aesthetics in my new book. In order to unearth the truth of Romaine’s life, I had to become an accidental biographer. That determination set me on a course I never intended to take. If you truly want to understand the real nature of the biographer’s art, you’ll have to read my introduction as to how this studio/art history/philosophy student was compelled to become a reluctant biographer by default.